It's not clear whether the she fired her own weapon before she was run over by the vehicle. TOWSON, Md. 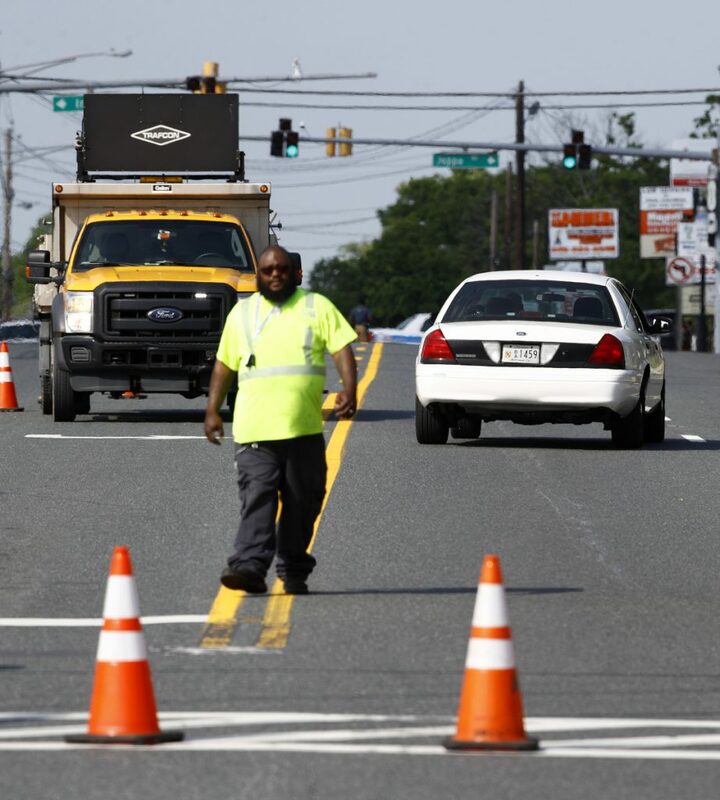 — Rifle-toting police swarmed into a Baltimore suburb where a female officer was fatally injured Monday, searching for suspects believed to be armed after witnesses reported hearing a pop and seeing the officer run over by a Jeep. The witnesses in a leafy community of suburban homes where the officer was injured described seeing her on the ground, badly hurt. Several people tried to keep her alive, but she was later pronounced dead at a hospital. Tony Kurek said his adult son was outside in the family’s yard Monday afternoon in the northeast Baltimore County community of Perry Hall when the son saw the officer with her gun drawn, confronting the occupants of a Jeep. “The next thing he heard was a pop, and he saw the Jeep take off and run right over her,” Kurek said. The car left skid marks behind, he said, adding that the woman was bleeding from her head. The officer was responding to a call about a suspicious vehicle when she encountered at least one suspect and was “critically injured,” police spokesman Cpl. Shawn Vinson said. The deadly encounter may have begun as a burglary in progress, said Vinson, who added that one home on the block had some damage to a patio door. Police said it was too soon to know how the officer was fatally injured. Neighbors called authorities and tried to save her, Vinson confirmed, but she was pronounced dead upon arrival at a hospital. Kurek’s neighbor, Dahle Amendt, said he had just settled into his recliner for a rest when he heard a woman’s voice outside his house. “I heard, ‘Get out of the car!’ ‘Get out of the car!’ Get out of the car!’ at least three times, and then a pop,” Amendt said. Amendt said his wife also ran outside and tried to revive the officer. “This is a shock. It’s a quiet community. It’s just so sad,” Amendt said. Vinson said the family of the officer, who would have been a four-year veteran in July, has been notified, but police didn’t immediately identify her.